I do not like letting Lily fail. And I was certain that she was going to fail when she wanted to bowl without the bumpers yesterday. I was positive that every single ball would be a gutter ball. But she insisted. That was the way she wanted to bowl. When it was her turn, Lily toted her ball up the lane, placed in on the floor between her feet, and gave the ball a great HEAVE with both hands. Without even seeing if her ball would knock down any pins, she turned around and walked toward us, grinning. On her second try, she heaved her bowling ball down the lane again. I realized that Lily has a different sense of failure than I do. I’m a terrible bowler. We were bowling with my sister-in-law and brother-in-law, who are on a bowling league. Ed bowled a turkey in his first game: three strikes in a row. I can barely make it up to 70 points when bowling. I’m a fairly competitive person. When I do something, I like to do it well. I may not be the best, or the winner, but I like to be pretty good at the things I attempt. I consider myself to be a failure at bowling. But Lily has different guidelines about failing. She was thrilled to be bowling. She was thrilled to be bowling with Mom and Dad and Sister, her aunt and uncle, without the bumpers. It didn’t matter to her that she wasn’t knocking any pins down. She stepped up to the lane again. Gutter ball, zero pins down. On her second try, the ball stayed on the lane. It didn’t go into the gutter. Instead, her ball knocked down seven pins! We all jumped up and down, clapping our hands and cheering for Lily. As we continued to play, Lily’s ball went into the gutter sometimes, but she also managed to knock down some more pins. Even if she hadn’t knocked down any more pins, I think she would have been happy. And she wouldn’t have failed. Just giving herself that challenge of bowling without the bumpers made her successful. Once again, I learned an important lesson from my daughter. That’s part of the joy of motherhood. It was too dark to take pictures in the bowling alley, so here is one of her playing in the snow. I just want you to like me. 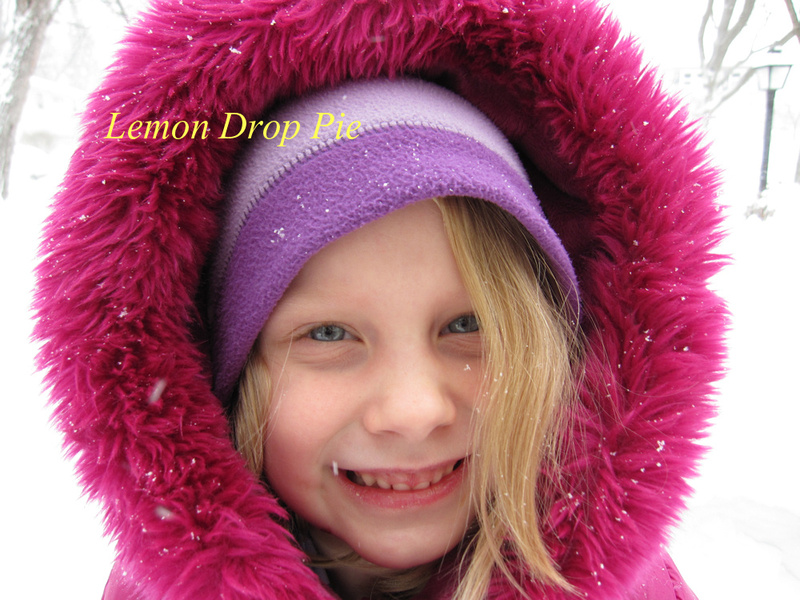 Lemon Drop Pie is now on Facebook. Go on, “LIKE” me! I am constantly learning from my babies, too. Today I had to let my own "fail" when she insisted on taking a shower on her own. I knew it wouldn't go well, but…I let her try. Sometimes that's all we can do. Hooray for Lily, your budding bowler! I am a terrible bowler, which is why when we go bowling, I make trips for food and beer and soda and hang out talking to whoever is not playing and cheer on whoever is playing. (I recently took a test to discover my spiritual gifts and mine is 'serve' and more and more I see where I do that in my life – cool!). This is me! I can't seem to just let Jonathan fail. Seriously…I have to stop myself so often and say, "Just let him be a kid…" It doesn't matter if he does it the way I do it…just let him do it the way he wants. It is such a hard lesson to learn! Kids are so smart. They know that joy is often just in trying something new. Nice post! I love that – her definition of failure was different. That's so wonderful when they're littlewhen they're just sprouting their wings – but when they come home from high school failing a class – because their definition of success is different – that's a tougher line to handle. I miss those days when the lesson was to just get out there and have fun – and building confidence in just the trying.Sweet post! I miss those bowling-ball type days! What a great lesson to learn! This is one I need to be reminded of! Enjoy the moment, etc. etc. Good for Lily! Go Lily! That's awesome that she knocked over some pins but also that she didn't mind the gutter balls! We're having a hard time unlearning the competitiveness Graham brought home from school and there are a lot of tears whenever he doesn't "win". But life is tough and he has to get over it! When I was a kid, we didn't even have bumpers. We bowled uphill in the snow and rain…and we turned out ok. Wait…I think I'm getting some things mixed up. Nice post. It's true, isn't it that our children can teach us much if we take the time to notice. I'm glad Lily was happy. That's a good one. I struggle with that, too. I try not to be a helicopter parent, but it's a daily battle. I barely bowl well on Wii so I wish I could bowl with the bumpers. Isn't that something. It would be wonderful if she could be so content like that with all things in her life. that is a hard lesson. Thanks for sharing your insight on that – its fun how little things teach us so much. Where there fries too? To make the evening/afternoon perfect? Congratulations Lily, on your bowling game and on reminding all of us to be careful about imposing our own attitudes on our children… What a great lesson! This is a lesson that I need to remind myself of! I can get frustrated when I'm not good at something but Lilly is right, it's not being good at something that makes us a success it's trying something new. She's a smart girl!